Many people find Twitter hard to understand – they tweet for few times and when they don’t see any activity in return, they just leave the platform forever. What they need is a bunch of Twitter growth hacking techniques that could up their social media game. The good news is that there is no rocket science behind the twitter success. If you see the influencers who have hundreds of thousands of followers on Twitter; they might have many things common such as they started using Twitter, at least, 5 years ago, they’re tweeting multiple times a day ever since, they engage with the followers etc. The concept of this article is to tell you some growth hacks that you could easily apply to get started with Twitter, or you could go back to Twitter if you had completely abandoned your Twitter account in the past. A lot of people simply tweet without hashtags – they miss out a huge amount of exposure because the hashtags are a major factor of reach on Twitter. In fact, using the hashtags is not enough, you must be using the right hashtags to grow because you would only make an impact by reaching out to the right audience. For example, if you belong to interior designing industry and are based in Los Angeles, then you should be using the hashtags related to interior design and Los Angeles, instead of fashion and beauty. Besides hashtags, Twitter search has its own value. It serves as a native search engine. Not only can you search hashtags, but you can also search for tweets and people. The best part is that you can keep an eye on the discussions that are happening across your niche or industry. You would find like-minded people through Twitter search. Overall, it’s a useful tool to grow on Twitter. A few tweets in a month are not going to work. If you want to grow on Twitter, tweet multiple times every day and get used to of it because it’s a long-term game and don’t take it as a 3-week stunt. A lot of people make this mistake on social media that they sign up on a platform to give it a try for a few days. There is no trying on social media. It’s not software that you should try first before actually start using it. If you want to grow on Twitter, you have to be committed to it because it’s going to take some time. So better choose the social media platform wisely. You can’t grow on Twitter alone. It’s a fact that most of the social platform algorithms are not designed for a one-way communication, but they rather demand a two-way communication. If you’re showing up on Twitter just to tweet or share your content, and that’s the only thing you’re doing, then you’re going to fail. The engagement plays such a big role in the Twitter success. Start interacting, supporting, and communicating with your followers. If you’re just starting out, follow relevant people, respond to their tweets, and explore to find more tweets and people to interact. Moreover, the engagement refers to liking the tweets, retweeting the tweets, and replying to the tweets from people you follow. One of the best Twitter growth hacks is sharing the content of others, especially influencers and industry experts. What happens is that when you share others’ content, not only do you build relations with others, but you also provide your followers with a variety of content to check out. You can’t publish content in bulk just to share on Twitter. So it’s always recommended to try out sharing others content. It’s a win-win situation because you’re building relations and growing your followers by sharing the content the right way. A lot of bloggers and brands mention influencers to help educate the readers in a certain context – they can leverage the mention by informing the influencers whether via email or Twitter that they mentioned them in the content. Chances are the some of the influencers could like the content and share with their Twitter followers. It provides a new level of access to the audience. So mentioning influencers and letting them know about the mention is a great way to build following on Twitter. Many of the digital marketing experts and social media experts don’t like tweets scheduling. However, it has become a quite popular nowadays. Despite the fact that some people like scheduling on social media and some don’t, but you have to give it a shot, in case, you don’t like it, you can quit it. We’re not discussing why it’s good or bad for social media growth. The point is that it has become an integral part of the social media management these days, especially with the services like Buffer, Hootsuite, and SocialSprout on the market. One of the hacks of Twitter is that when you natively upload your photos and videos; it gives you an edge over the content that you share through Instagram or YouTube accounts. Native uploading has its own value to the platform because it engages differently and gets share more than other content. When you tweet a blog post or a website link, sometimes it seems long to fit in. Always use a link shortener like Bit.ly or Goo.gl to make the link compact and short for the tweet. Sometimes, a long link seems hideous on Twitter. You might not want to affect the click-through on your tweet links. So consider shortening the URLs. Twitter growth hacking techniques discussion can’t be finished without discussing the profile management tips. Your Twitter profile contains immense energy to give away to the audience who land on your profile. Whenever you open a Twitter profile, you always see the cover and display picture. If these two things are on point, the chances are, you’re moving ahead to look at the further parts of the profile. Secondly, you look at the bio and link of the profile. Bio does a lot of work when it comes to Twitter. A short, precisely written Twitter bio will help you tell whatever you’re up to. In the end, don’t screw up with the profile link. Add your website or blog URL and avoid putting shortened URLs that seem suspicious in the link section. I’ve shared some of the simplest and useful growth hacking techniques for Twitter. 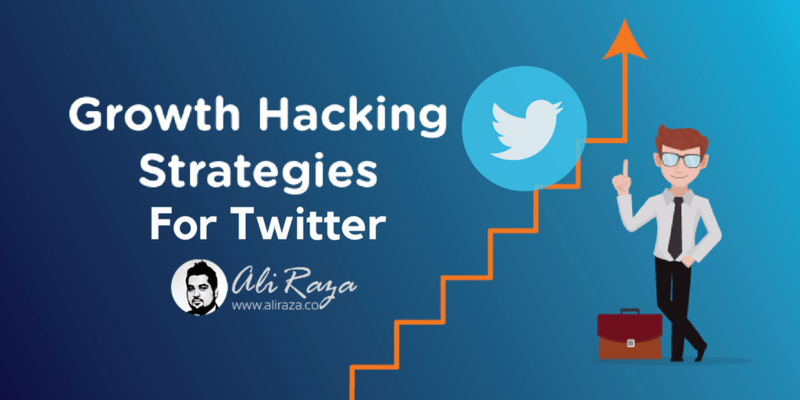 If you’re getting serious about Twitter in 2019, these Twitter hacks will provide a launchpad to boost your Twitter growth. Is there anything else you know about Twitter that you could share with us? Your comments made my day! =D, Thank you so much for appreciation! Twitter is the most useful tool for digital marketers and growth hackers. The community there is so active and actually you can use it for your own goods. For example, top marketers hang out there like Neil Patel & Brian Dean, if they decided to share one of your articles, it will surely go viral. Great post indeed, keep up the good work. Very well said. Indeed if that happens, it’s a jackpot for any blogger if it’s get viral.